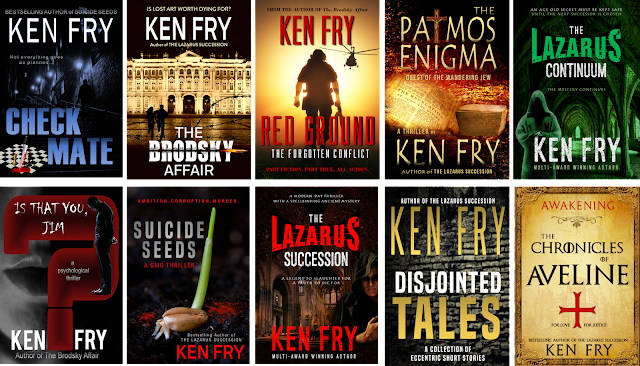 (2016) Today, I have the pleasure of interviewing my friend and client, Ken Fry, an exceptional writer of Suspense Thrillers. Ken is from Surrey, UK, and has only recently ventured into self publishing. I so admire his tenacity to learn about the ins and outs of the Indie industry, and to self publish only high quality books. His writing style is lyrical, and if you like suspense thrillers with the required murders and conspiracies, if you like Dan Brown, check out his books. Ever since I can remember, books and literature had always been a compulsion. It wasn’t until I decided to make an exit from business and commerce some years back did I seriously decide to fill my time doing something I enjoyed. After my wife sadly passed away, I then found real time to get started. My first published story was Dying Days in 2010. Which do you prefer, traditional or self publishing? That’s a difficult question. With traditional publishing you can let go of a host of tasks and hopefully let the publisher take the strain. However, in doing so, you do lose control of how you can shape your marketing and sales strategies. Plenty of traditionally published authors are switching to self-publishing where their sales figures are just as good and even better than the latter. They also get a bigger royalty too. I prefer self-publishing… it’s also more exciting. *** Ken Fry pulled The Lazarus Succession from his publisher and has been a #1 bestseller on Amazon UK in Religious Mysteries, never leaving the top 3 since July 2017. What are the best and worst parts of being self published? The best parts are the number of fellow authors and friends I have picked up on the way…via Twitter/Facebook and similar sources. Then comes the day of publication…that’s fun. The worst part is the whole host of new skills that need mastering in terms of IT and the constant checking required. I now get up in the morning an hour earlier to handle my Community-Dashboard/Hotmail/Twitter etc. putting into place all queries, responses, and KDP and Amazon. My worst characteristics are impatience, too impulsive and an ability to not truly hear what others are saying to me. On the plus side, I have a never ending curiosity about life and if it has a meaning, learning processes and anything that can better mankind. Writing keeps me in check and gives me purpose. Up at 6.00 am … drink tea, walk Dickens, my dog for 30 mins…breakfast of large espresso coffee, toast and cereals… shower, clean up mess from day before, deal with social media etc.. start writing processes around 9.00 am. 12.30 break for walk with Dickens and frequently into local pub for a glass of wine or two. Back home and more writing…running out of steam by 4.00. Start cooking and mentally switch off to await a decent movie before bed. That’s about it! Why did you choose to write Suspense Thrillers? I didn’t. They chose me. No deliberate intention, that is just what flowed out! Although heavily embellished in the fictional world there is an element of truth in them all. Dying Days was related to a family secret I knew about. The Lazarus Succession came about by a story that was told to me once while I was in Spain, and The Brodsky Affair, again, was based on a true event involving a Russian artist who perished in a Nazi concentration camp, before his paintings were rediscovered in Paris. Travel does give extraordinary insights. I tend to write in a linear fashion although I am known to move away from that at times. This gives me cause to wonder whether I should embark on ‘Scrivener’. I have a rough idea of how the story should progress but more often than not it moves away totally from that idea into something else. I like to feel I’m in control but the keyboard/pen seem to posses a life of their own. 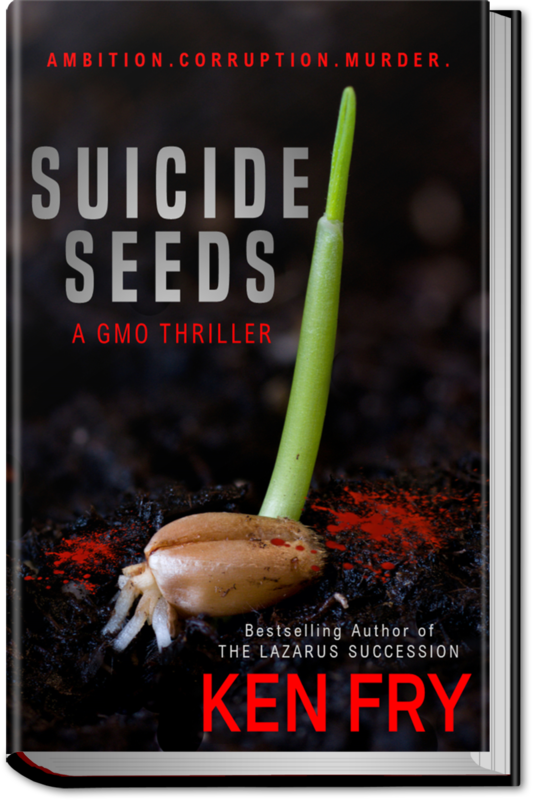 Suicide Seeds is set in West Africa and is based on an element of truth surrounding the Genetically Modified Crop industry. It explores in murderous fashion the corruption and dishonesty of a fictional western company and certain government officials as a plot is hatched to make the whole of West African agriculture dependent upon a non seeding crop that destroys everything it comes into contact with…. That’s all I’m going to say about that at this stage….but it should be published late August… I have other projects ongoing and have completed Part One of an intended medieval saga. On file, I have two other completed narratives but they need serious looking at. 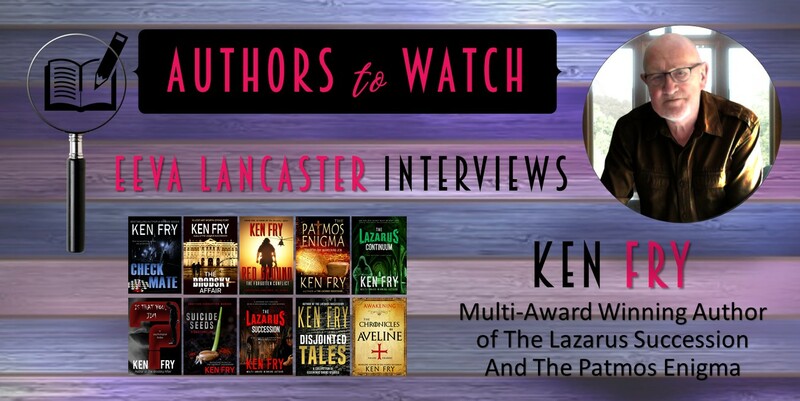 Thank you, Ken, for sharing your time with me. We look forward to more of your writing.